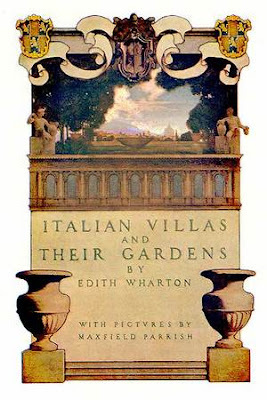 The reason Italian villas (and Italianate gardens) built in the early twentieth century dot the Midwestern landscape like some alien species is largely due to the influence of one woman, Edith Wharton, who was rather the Martha Stewart of her day; chief arbiter of domestic taste. 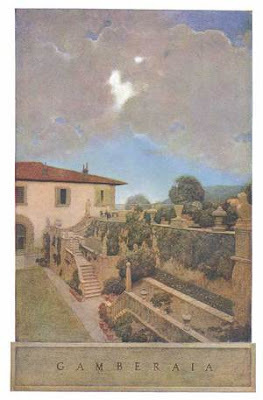 Her 1904 book, 'Italian Villas and the Gardens', with gorgeous illustrations by Maxfield Parrish, ignited a fad among the nouveau riche. Their resulting 'power gardens' represent one of the only times in American history that a garden style was used to confer high social status (though this is common in European cultures). Speaking as it did of the urbane continental sophistication to which they aspired, the style was irresistible to midwestern oil barons still rough from the frontier. One of these was Waite Philips, whose landscape architect, Herbert Hare [who needs a biography by the way, and I would be pleased to write it!] was responsible for the grounds of Philbrook. Thanks for answering a question I've had for years about why there are Italianate houses here in Northern Illinois. I've read about Edith Wharton's garden, but I had no idea that she inspired a whole home design craze. It's sort of like the current fashion for faux French chateux.